Their legs are pink, with webbed feet and they have heavy, slightly hooked bills marked with a red spot. Young birds are mottled brown. 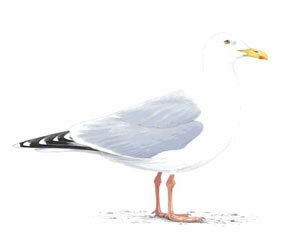 Herring gulls are widespread and can easily be seen at virtually any seaside town in the breeding season, and inland all year round, especially at rubbish tips, playing fields and reservoir roosts.